There are many ways in which you can ensure that your garage door stays in good condition. One way is to repair any wear or damage as it appears rather than wait until a larger problem appears. We also recommend trying to keep your parts well lubricated and a clean as possible. Painting is a great way to protect the material of your door and to prevent rust. 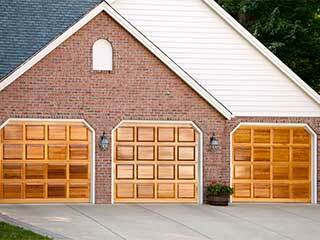 Many garage doors are made of metal and as such can erode unless galvanized. Paint will ensure a thick coating to make the door more resistant to water, air and mineral salts that tend to erode metal materials. If your overhead door is made of wood, the right paint will also play a fundamental role in ensuring that the life of the wood is maximized. Paint serves a significant role in maintaining wood resistance. Cleaning is another way of keeping your door and system in good shape. During cleaning, dirt and other elements that might encourage wear and tear of the material will get removed. It is advisable to use soft soap and water. The sensors will also work better without dust on their surface. After cleaning your system and parts, we also recommend lubricated the moving components to protect against rust. Beware though, if they're not cleaned well before the lubrication is applied, some components will become stiff and attract tons of dust, making the situation worse than when you started. You should always close the door before cleaning or applying lubrication - when the door is closed you should also pull the release cord to limit any possibility starts moving while you've got your hands on the system! You should always avoid touching the springs with your bare hands - these parts can be very dangerous. All you need to do is simply spray a thin line of lubricant along the top of the spring - the movement of the door once re-enabled will allow the lubricant to work itself into the spring. Further questions regarding your garage door system and maintaining it's life-span? Contact us at Garage Door San Jose for advice. Is My Garage Door a Safety Hazard? We’re a local team of garage door repair specialists, and what sets us apart is our dedication to customer satisfaction. Our expert technicians use only the best replacement parts, so we can guarantee a high standard of work. Take a look at the rest of our website to learn more about what we can do. Thank you for choosing our company! Feel free to browse our website for more information in the meantime. Our team at Garage Door Repair San Jose is at your service any time!